Wear this adorable short homecoming dress for an eye-catching look at a sweet-sixteen celebration, hoco party, or another semi-formal event. 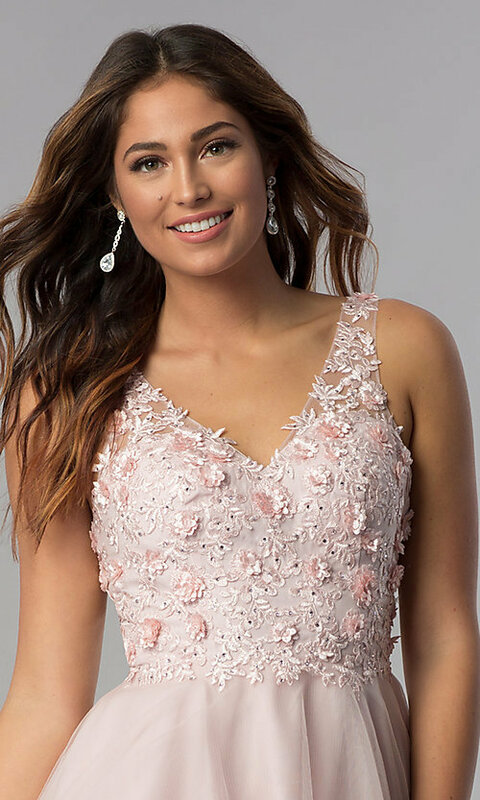 In soft blush pink, this lovely short tulle dress features gleaming embroidery, sparkling rhinestones, and 3-D floral appliques that add texture to the stunning fitted bodice. A v-neckline is mirrored in the back of the pretty pink dress with bold shoulder straps that provide stability. A tulle and satin lining adds volume to the short a-line tulle skirt that flows away from the natural waist to a trendy rolled hemline. Available in misses and plus sizes, this charming short pink homecoming dress, under $150, is an affordable style for the girl who wants to make a lasting impression.